Scarlett makes for a vibrant color name with plenty of Hollywood glam. Thanks to Ivy for suggesting our Baby Name of the Day. Here’s a trivia question: what did author Margaret Mitchell almost name her legendary heroine? We all know the beautiful, headstrong Scarlett O’Hara as the central figure in Gone With the Wind, but Mitchell nearly named her Pansy instead. Mitchell had a last minute flash of inspiration, and you know the rest. The 1936 novel put the name on the map. It debuts in the US Social Security data the following year. A very few people did have the name before the bestseller, almost certainly thanks to the surname. In the novel, the leading lady’s full name is Katie Scarlett O’Hara, named for her paternal grandmother, Katie Scarlett. Turns out that it was an occupational surname first, given to dyers of woolen cloth, or possibly those who sold it. Way back then, scarlet cloth came in colors besides red – though red was among the most popular. The word probably comes from the Persian saqirlat – fine cloth, via the Late Latin sigillatus – elaborately decorated clothes. The word became scarlata in Late Latin, escarlate in Old French and Spanish, and scarlatto in Italian. You might find some magic in the word. It shares roots with sigil – a magical symbol – but also signal and sign. As colors go, scarlet reads bold, even dangerous or forbidden. It appears in the Book of Revelation. Sir Arthur Conan Doyle writes of “the scarlet thread of murder” in a Sherlock Holmes case circa 1887. And, of course, Nathaniel Hawthorne’s 1850 novel The Scarlet Letter makes the color synonymous with sin. Or maybe just disease, as in scarlet fever, so called because of the distinctive red rash that characterizes it. Then again, The Scarlet Pimpernel rescued French aristocrats from the guillotine. That was 1905, so the name’s reputation wasn’t all bad. Today, the color remains vivid and dramatic, but not quite so scandalous. Back to Gone With the Wind. The 1936 novel became a 1939 movie, with a nation-wide search to cast the role of Scarlett O’Hara. From 1940 to 1943, the name appeared on the fringes of the US Top 1000. It fell in use, but appeared from 1962 to 1963. That’s likely due to the book’s twenty-fifth anniversary in 1961, and the publicity surrounding the event. In 1991, for the book’s fiftieth anniversary, Margaret Mitchell’s estate commissioned a long-awaited sequel. Novelist Alexandra Ripley penned it. Critics savaged the story, but it still topped bestseller lists for weeks, and a can’t-miss miniseries quickly followed. By 1992, Scarlett returned to the US Top 1000. This time, it stayed. A handful of other uses bolstered the name, like Hugh Grant’s quirky red-headed roommate in Four Weddings and a Funeral. Color, nature, and noun names were rising at time, too. By the mid-1990s, Ruby was climbing; not long after, Violet would return to the US Top 1000. But one woman deserves most of the credit: Scarlett Johnansson. Her first Independent Spirit award nomination was for 1996’s Manny & Lo. In 2003, Lost in Translation transformed her into a major celebrity. Scarlett arrived in the US Top 100 in 2011, and the name shows no signs of leaving. As of 2017, it’s holding steady at #18. Despite all that popularity, I think this name still feels edgy and cool. Maybe it’s the color that does it. Perhaps it’s the unexpected sound. Or maybe it’s Hollywood – the combined weight of ties to a legendary fictional character and a major star of our time, too. Either way, this remains a name that feels bold and confident, a modern choice with style to spare. Would you consider this name for a daughter? Originally published on June 29, 2011, this post was revised substantially and re-published on April 10, 2019. Scarlett doesn’t work for me, though Violet does. I do think Scarlett will follow Charlotte right up the charts though. But I never cared for GWTW, as much as I love Vivien Leigh. If I was going for a red tinted name I’d go for Claret over Scarlett. Not really a fan. Scarlett Johansen doesn’t really help me like the name either……. My younger sister is Scarlett Grace 🙂 I like the name. Popularity wasn’t a factor when we named our Scarlett, but I have to admit I feel a little twinge every time I see it in the “Most Searched” cloud on Nameberry. I guess I just have to remember that just because a name is popular doesn’t mean she’ll know a lot of girls with the same name. Gotta say, I liked the name Scarlett until I saw Gone With the Wind. Yikes! I would NOT want to name my daughter after her. Overall though, I do like color names, but they don’t fit with my last name. Alas. I’ve never understood the fawning love of GWTW, Scarlett was such a manipulative, selfish b***h and the Jim Crow era’s romanticism of the the Old South. I realize It’s considered a great love story, but I have trouble with the idea that people are naming their daughters after that character. Along a different literary vein, there is a YA chick-lit novel called Suite Scarlett by Maureen Johnson, that my 14 year old adored. Obviously, the protagonist is named Scarlett. With the growing popularity the name, maybe Miss O’Hara won’t always be my first thought, but I still don’t like the name. When I was around ten a new friend said to me, “I don’t like the name Charlotte, I think I’m going to call you Scarlett instead.” So for a short period of time I answered to Scarlett. Then there’s the occasional individual who thinks it’s funny to say something about “Charlotte, the scarlet harlot”. I don’t mind the name — I do find it quite pretty — but it’s not my name and I don’t think I’ll ever use it. There’s a little Scarlett in one of Roseanna’s playgroups and I wouldn’t be surprised if I encounter more and more of them because I expect the name to continue to rise. I like how sassy Scarlett is. However, her popularity would make my shy away from using the name. Scarlet(t) is extremely trendy, and not really to my taste. It looks like a noun meaning “little scar”. I also can’t really separate it from the ‘scarlet woman’ association. As colour names go, I much prefer Violet (or Violeta or Violette) or Bianca. I like Scarlett, think it’s more ” namey” than Scarlet and would definitely rather meet a Scarlett than yet another Morgan, even! It’s strictly middle name material for me, it’s a bit too brilliant a shade for me, personally. That and Violet’s a family name for me. Other color names that appeal to me: Lavender, Lilac, Indigo, Moss & Plum. I have to ask, why do I see Lavendar quite often? It doesn’t even look right! anyone know what gives, there? Or perhaps some people just can’t spell ;D.
I went to school with a guy named Moss, it’s also considered a variant spelling of Moses :). Scarlett was ranked 25 in the UK in 2009 and climbing at a rate of knots. More than one of my 6 1/2 year old daughter’s playmates is a Scarlett! I’m 99.9% certain Mitchell intended Scarlett as the surname of Katie Scarlett (the grandma). It was very common in the 19th C on both sides of the Altantic to bestow a grandparent’s name and surname on a child as their first and middle name – and not uncommon for the child then to be known by the former surname. The same thing happened to my grandmother; Caroline Gayther Trout (what a name! ), who was named after her grandmother Caroline Gayther. My grandmother was always called Gayther (although she often got Gertie instead, as Gayther is hardly a familiar surname, never mind first name!). Although the color and surname share the same source, ‘scarlet’ didn’t come to mean ‘scarlet’ – iyswim – until the 15th C. Before then, it referred specifically to a type of cloth of scarlet color. The surname probably arose for someone who dealt in scarlet (the cloth) or wore it a lot! We got the color scarlet from the cloth, in the same way as we later got the color orange from oranges :). You’re absolutely right about the surname. I read GWTW obsessively in my tweens, and I kept thinking that her grandmother’s name must’ve been Katie Scarlett Smith or Katie Scarlett Jones. I was equally obsessed with Scarlett’s sisters’ names: Carreen, from Caroline Irene, and Suellen, from Susan Elinor. Great smooshes, both! That’s so interesting! My mother and aunt are both named after a grandmother’s first and maiden names (Mary Bynum and Katherine Madigan, respectively). My grandmother told me that her dream was to have two girls and name them after the grandmothers. She must have been quite old-fashioned to do this during the mid-20th century. I’m a GWTW fan and I honestly didn’t know about the Pansy thing until just now (read the book ~ 15 times since I was 12, never seen the movie). Thank you! This may be a new record for my “learning something new every day” (1:28am in the ‘day’ LOL) resolution. 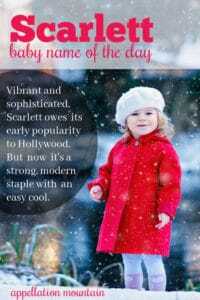 I like the name Scarlett and I would rather run into one on the playground than McKenna/McKinley/McMyparentsaretryndee but I don’t see myself using it since I already have one kid with an “S” name (two if you count the small furry son, my kitten) and I’d rather mix things up a bit. I very much dislike Scarlett. Scarlette is fine for a girl, and Scarlet is fine for a boy or girl, but the spelling Scarlett just makes my brain hurt. Plus, I’m not a fan of GWTW at all, so that certainly makes it worse for me. I couldn’t puzzle out how the -tt caught on, but I’m assuming it is one of those quirky surname things that Mitchell embraced – and we’ve all been following ever since. Scarlet strikes me as incomplete, though I’m pretty sure it is the spelling of (yet another) S-name Sylvester Stallone gave to one of his daughters. And it has charted in recent years, at least for girls. Definitely fits in with colour names like Sienna and Violet. I went to school in the 80s with a Cerise … I like the name Lavender! I still see Teal being used a fair bit now; obviously had staying power. Oh, I do like Indigo! Fawn reminds me of Brodie … which 80s political scandal was she attached to? Lavender has potential – she’s in Harry Potter, too, isn’t she? I also like Lilac, though I first heard the name on a cat! Stephen Moyer (Bill from True Blood) has a daughter named Lilac. I absolutely love it. Scarlett is too sultry for me. Abby – Fawn Hall helped Ollie North shred documents. EXACTLY – thank you! Fawn Brodie was a biographer. I confuse her with Vaughn Bode in the Beastie Boys’ lyrics for “Sure Shot” – which is why, I think, she rattles around in my head. I know a Cerise too, now that you mention it. I also went to school with a Fawn. I never, ever think of that as a color, only as an animal. […] about choosing Blue for a girl. 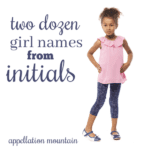 […] fact, the biggest influence may be the rise of creative, franglais-style names. […] writing about Scarlett the other day and finally reading The Help, I’ve had Southern names on the brain.